On Tuesday, the Yankees were simply looking to survive. Tonight, they hope to conquer. Thanks to the surprising performance of A.J. Burnett in game 4 of the division series, the Yankees escaped from Detroit with their World Series hopes intact and now face a sudden death playoff game for the first time since losing the 2005 ALDS to the Anaheim Angels. 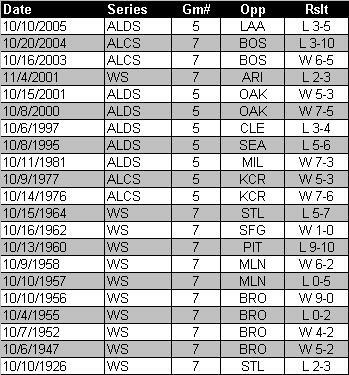 The Yankees have played in the most winner-take-all October showdowns, which shouldn’t be surprising considering the team’s playoff history encompasses 368 games to date. However, despite the franchise’s incomparable 48-22 record in all postseason series, the Bronx Bombers are only 11-10 when facing a mutual elimination. Of course, that speaks to how difficult it has been to knock the Yankees out in October. While fewer than one-fourth of their series wins have come gone to the wire, almost half of their loses have gone the distance. 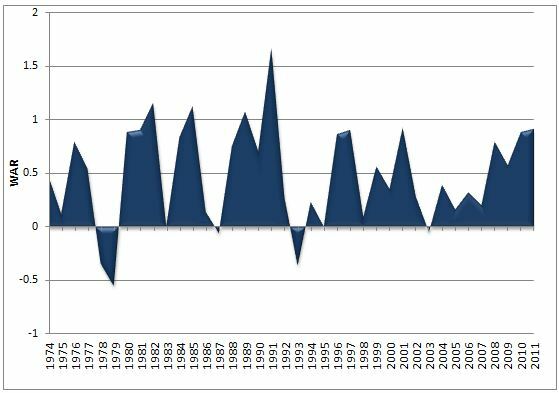 Because the Yankees have played in almost 14% of all sudden death postseason games (21 of 152), many of the sport’s most dramatic October moments have involved the pinstripes (for a companion piece on sudden death games involving all teams, check out my latest post at Bronx Banter). In terms of WPA, five of the top-25 offensive performances in the history of deciding games have been recorded by Yankees. Perhaps the most famous such game is Chris Chambliss’ pennant winning homerun against the Kansas City Royals that sent the Yankees back to the World Series in 1976 for the first time in 12 years. Of course, younger fans of the Bronx Bombers are probably more partial to Aaron Boone’s long ball, which sealed the Red Sox fate in the 2003 ALCS. Either way, both moments not only rank among the most dramatic in Yankees’ history, but all of baseball lore. For one week, Yankees Universe has become Bizzaro World. Once home to an infallible closer and dominant left handed ace, Yankee Stadium now features impostors who give up home runs at an alarming pace. 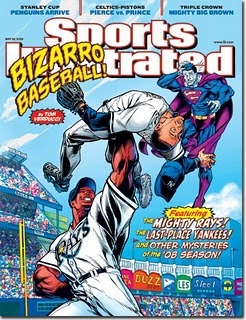 Apparently, the rest of the American League has found the Yankees’ kryptonite. The Yankees harrowing week started with a rare string of three straight games in which Mariano Rivera surrendered an earned run, a span that encompassed two blown saves and home runs allowed in consecutive appearances. As if Yankees’ fans weren’t busy enough fretting about the worry-free Rivera, last night provided another head scratching development. One start after losing to Boston for the fourth time this season, all expectations were for CC Sabathia to continue his dominance against the rest of the American League. The Tampa Rays, however, had other ideas, and they used the long ball to express to them. When Sabathia’s outing was concluded, the big lefty had surrendered five home runs (including two hit by left handed batters), which was not only the highest total allowed in his career, but within one of the highest total allowed in the major leagues since 1919. Despite avoiding that infamy, Sabathia did tie a franchise record. All season, Rivera and Sabathia have been close to automatic, so the thought of a week in which three loses are directly attributable to that dynamic duo is almost unfathomable. Before too long, you can all but guarantee the Yankees’ two super heroes will be back on the right path, but, in the meantime, it’s only natural to wonder what strange occurrence will come next? Maybe a complete game shutout by AJ Burnett? Scratch that. Even Bizzaro World has its limits. In an early morning post at Bronx Banter, I took a look at some of Mariano Rivera’s failures, and pointed out how they sometimes define his greatness even more than his long resume of success. The timing of the post was particularly relevant because in this afternoon’s 7-6 victory against the Angels, the future Hall of Famer had another blip that illustrates just how incredible his long career has been. Like every manager, Joe Girardi has become a slave to the save, so, despite having a four-run lead, the Yankees had Rivera warming up while Cory Wade started the ninth inning. Almost as if part of a self-fulfilling prophecy, Wade allowed two of the first three batters to reach, which brought the tying run to the on-deck circle and Rivera into the game. Usually, Mariano quickly restores order in such situations, but this time, he added a little fuel to the fire. On his first pitch, a flat cutter that hung over the inside corner, Russell Branyan deposited a towering fly ball into the right field seats, drawing the Angels to within one, and Rivera to the brink of another blown save. After suffering a third consecutive blown save, Joakim Soria has been at least temporarily relieved of his duties as Kansas City Royals’ closer. Over the past four seasons, Soria not only established himself as one of the best closers in the game, but also began to draw comparisons to the great Mariano Rivera. That’s what makes his sudden demotion so shocking. Then again, maybe we shouldn’t be that surprised? Since Rivera ascended to the throne of the game’s greatest closer, there have been many would-be challengers to his crown, but none have been able to stand the test of time. Meanwhile, the 41-year old Rivera keeps rolling along. In addition to Soria, other closers who have either drawn comparison to or been billed as “the next Mariano Rivera” include Billy Wagner, Francisco Rodriguez, Jonathan Papelbon and Brad Lidge. In addition, at one time, it was suggested by some that closers like Joe Nathan and Eric Gagne had actually surpassed the great Rivera. Although many of these pitchers have had one or two seasons as good as or better than Rivera, none have maintained his longevity or consistency. And, while the youngest of the bunch, Soria, Papelbon and Krod, are still capable of striving for the throne, each has had at least one hiccup, something Rivera has avoided to this day. Note: “Top” closers, such as Troy Percival and Trevor Hoffman, who pre-dated Mariano Rivera not considered. 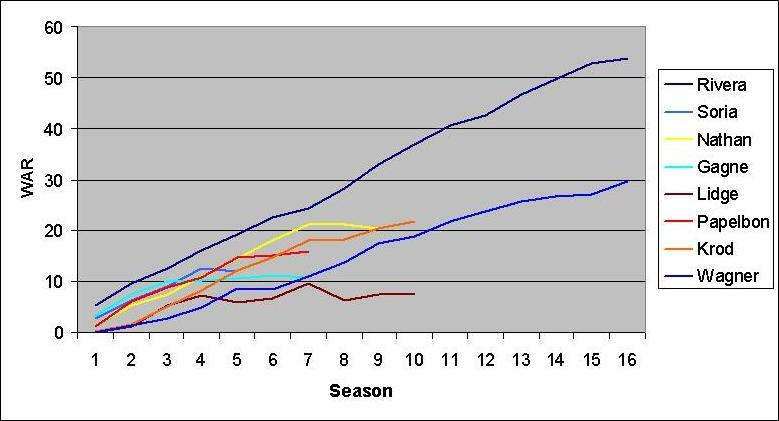 What has made Mariano Rivera the undisputed king of closers is how long he has been able to sustain his dominance. 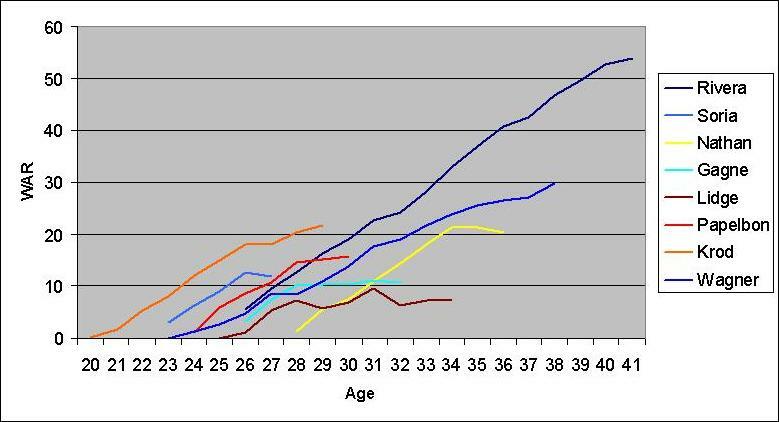 While the career trajectories of his contemporaries have tended to flatten out over time, Rivera has maintained an almost steady climb well past the age when most closers begin to falter. It remains to be seen for how much longer Rivera’s career path with continue its inexorable climb of greatness, but as younger challengers to throne continue to fall by the wayside, it’s still “long live the King”. When Mariano Rivera finished off the Yankees’ 7-3 victory against the Blue Jays on Wednesday, he became the first pitcher in major league history to record 1,000 games with one team. Remarkably, Rivera accomplished the feat two days removed from the 16th anniversary of his major league debut on May 23, 1995. 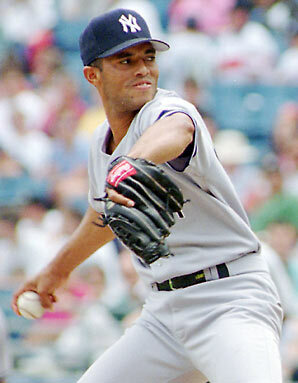 Mariano Rivera made his major league debut on May 23, 1995. Almost 16 years later, Rivera pitched in his 1,000th game for the Yankees. Rivera’s first appearance as a Yankee came as a starter in Anaheim. The skinny right hander was summoned to the major leagues when Jimmy Key was placed on the disabled list, but his promotion might just as well have been a birthday gift to manager Buck Showalter, who was celebrating his 39th year that very day. Although Rivera was a relatively unknown at the time, the hard throwing Panamanian first opened Showalter’s eyes during spring training in 1992. At the time, young arms like Mark Hutton, Sam Militello, Bob Wickman, Jeff Johnson and Sterling Hitchcock were touted as the future of the Yankees, but the rookie manager instead took an immediate liking to Rivera. In particular, Showalter made note of the young pitcher’s composure and control, two qualities that would become the hallmarks of a Hall of Fame career. The night of Rivera’s debut, the crowd at Anaheim Stadium was treated to an outstanding pitching performance, but unfortunately for the Yankees, it didn’t come from their rookie right hander. Instead, Chuck Finley was the star of the night. 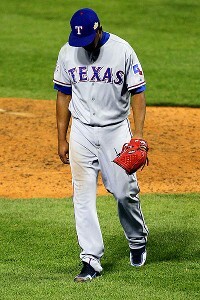 The left hander, who made a habit of dominating the Yankees, struck out 15 batters on his way to a two-hit shutout. Finley’s performance, which was the 100th of his career, and the Angels’ 10-0 victory completely overshadowed Rivera’s debut, which lasted only 3 1/3 innings. In the brief outing, Rivera surrendered five runs and eight hits, but also showed some flashes of brilliance by striking out five. Those flashes would eventually become roaring flames, but in the meantime, the young Rivera had a few lessons to learn. As we now know, Rivera’s growing pains didn’t last long. After a few more inconsistent starts and a demotion to the minors, the future closer had what many consider to be his real coming out party on July 4. This time, Rivera’s outing turned out to be a worthy gift for the Boss, whose birthday’s cake must gone down a lot easier after Rivera’s 11 strikeouts in eight shutout innings. The rest of the season had its up and downs for Rivera, but the 1995 ALCS cemented his future as a prominent figure in an emerging Yankees’ dynasty. Unfortunately for Showalter, he wouldn’t be around to see it.